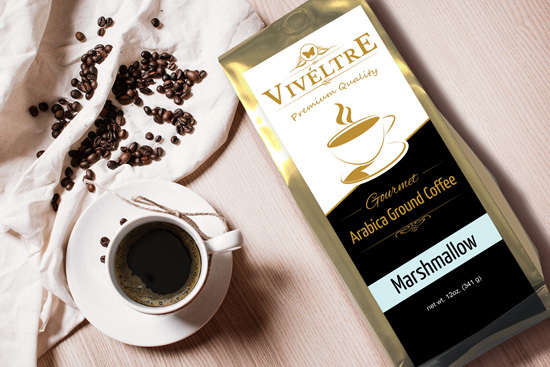 Viveltre’s gourmet flavored coffee line would not be complete without a marshmallow coffee so we present to you a crowd favorite and our signature flavor… Marshmallow White Chocolate! Sip on the flavors of sweet and toasty marshmallows, paired with decadent white chocolate. Serve with s’mores around the campfire or with dessert after a special meal! Viveltre gourmet flavored coffee uses a light roast of Arabica beans, brewed locally in small batches. Our methods ensure the highest quality and standards go into the production of each bag. Viveltre proudly uses green coffee roasters in an effort to reduce our carbon footprint. All our Arabica Ground Coffee is crafted to perfection with all natural flavoring, lightly roasted and shipped fresh to your door in a 12oz bag. Shopping for Flavored Coffee only? Enjoy FREE 2nd Day Priority shipping! ?